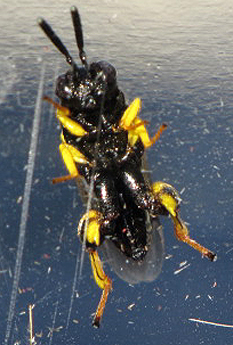 Underside of wasp. Emerged from pupa of Edward's Wasp Moth - (Lymire edwardsii). Thanks for these extra views. You can see more of the features now including the flattened frons, antennal insertion points, marginal wing vein, and arcuate hind tibia which indicate this genus. There are also several recorded species of Brachymeria that attack this particular host. I also went to the taxonomy page and saw the five genuses listed for Chalcidinae. Moved from Conura amoena. Looks quite different from those, will place at family level in hopes of a further ID. Do you have a top view?